So, remember that WIP list? It grew. I couldn't help myself! But the more I talked about that list the more embarrassed I was. Not so much overwhelmed, but shamed by it. Was I that incapable of finishing something? What was I avoiding by constantly giving in to my impulse to create new things? (Oh the therapy required...) Really, though, I just get excited by new ideas and put all things aside to create. I know I'm not alone in that. 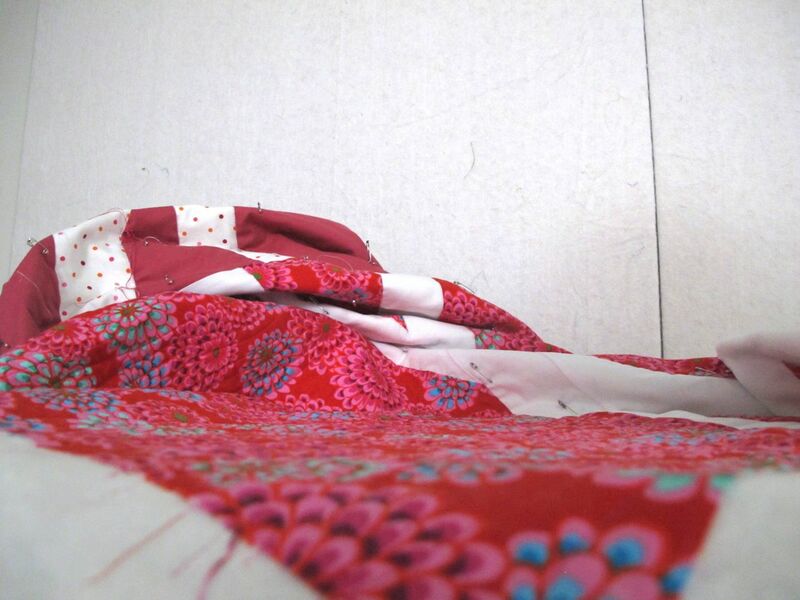 I also know that I was putting off quilting a very large quilt. 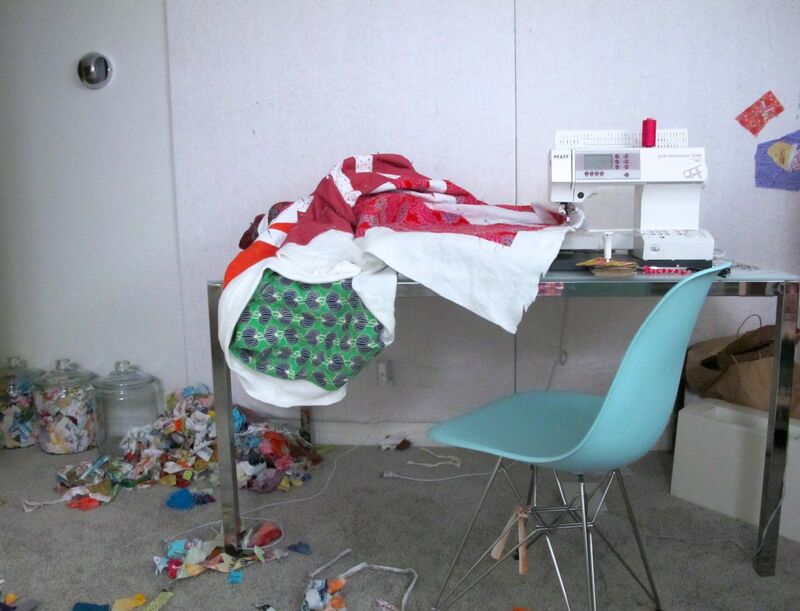 The literal elephant in my sewing room was my anniversary quilt. King sized, already basted, thread in hand, and the dread of quilting that on my home machine. Totally doable, but daunting in thought. I also knew that finishing it would be freeing, not to mention kind of me since this was an anniversary present for our anniversary last year. 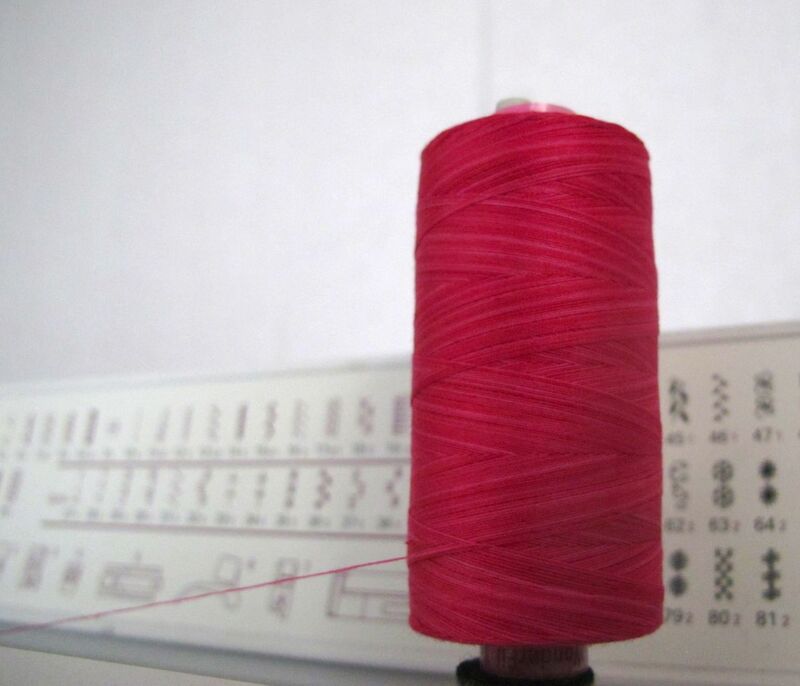 So I grabbed my specially purchased pink thread. (Thank-you Andrea for helping me pick it.) I loaded up my bobbins and some Downton Abbey. And I also cleaned off my design wall and packed away the WIPs I've been playing with. No distractions! I think that was the hardest part. And the most necessary. So, this morning, after a few hours of quilting I don't feel like I made much of a dent in the quilting, but I started. And I'm not even sitting at the table to type this. I am not taking that quilt off the table until it is done. I swear. No new projects until the label is on this thing and it graces our bed. Good luck with that. I need to tackle my monster UFO too. Maybe today will be a good day to start. I really neeed to put away all the distracting WIP/UFOs of mine too. Good for you getting after that quilting. You will finish it in no time. I have a lot of UFOs too, and have been trying to finish them up. The nice thing is since there are partially done, a finish comes quicker and that reward is motivating! I've been trying to do this with a big project recently - I know I start other things because I'm avoiding the parts I don't like (I do this at work, too) but some things just need the dedication on working on it a little bit by bit. Of course, this weekend when I was supposed to be single-minded I did prep the projects I'm hoping to work on when it's done. I have a giant one im putting off too! Being Texas and its hot... ive decided it can wait till fall and ive started tackling all of the other ufos that were stadcking up behind it! I love your focus and the stage you set for success. You can do it! I'm cheering for you for sure, you can certainly get this one done soon. I admire all the discipline to get to this point. I clear my design wall sometimes too when I have to stay focused and get a challenging quilt done. The distractions make it far too easy to procrastinate. I'm looking forward to seeing the pictures of your finished quilt gracing your bed! Ps I'd love to help you with your quilting sometime! That's the key...don't start a new project, until the current one is complete!! It works for me. This is a big work for you to make but i trust you! Great resolve. How do you quilt and elephant? One stitch at a time! Good luck! Love it! Our guild just did a UFO challenge. And you know what? I only finished one thing on my list. Oh I did accomplish projects just none of the ones on my list. It was kind of shameful but I had to sooth myself knowing that even though the list didn't get smaller I did accomplish something. Sigh, everything eventually does get done but I've learned it might have a better chance if I don't put it on a list! It's just like eating an elephant - one bite at a time. :-) You'll be finished before you know it and back to creating something new!